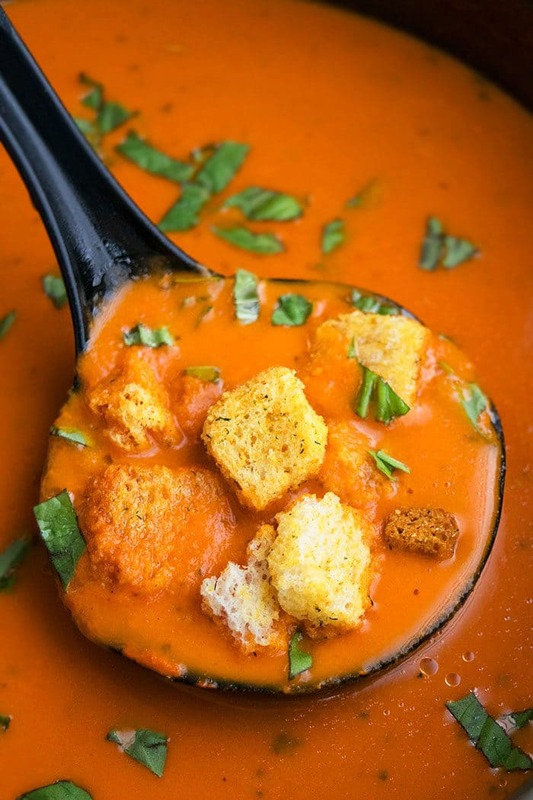 Quick and easy roasted red pepper soup recipe, made with simple ingredients in one pot on stovetop. This 30 minute meal is creamy, loaded with tomatoes & Italian herbs. This is the best healthy soup and an easy weeknight meal that’s warm and comforting, just like this Tomato Basil Soup (One Pot) and my Easy Homemade Chicken Noodle Soup (One Pot). 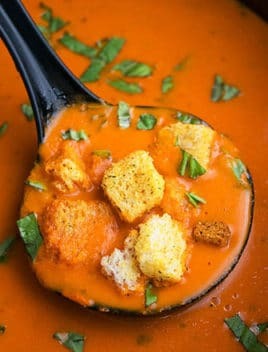 How to make roasted red pepper soup/ Roasted red pepper tomato soup? Mix in flour and cook. Add tomatoes, red peppers, broth. Blend and make soup smooth. Mix in sriracha sauce, Italian seasoning, salt, pepper. Garnish and you are done. 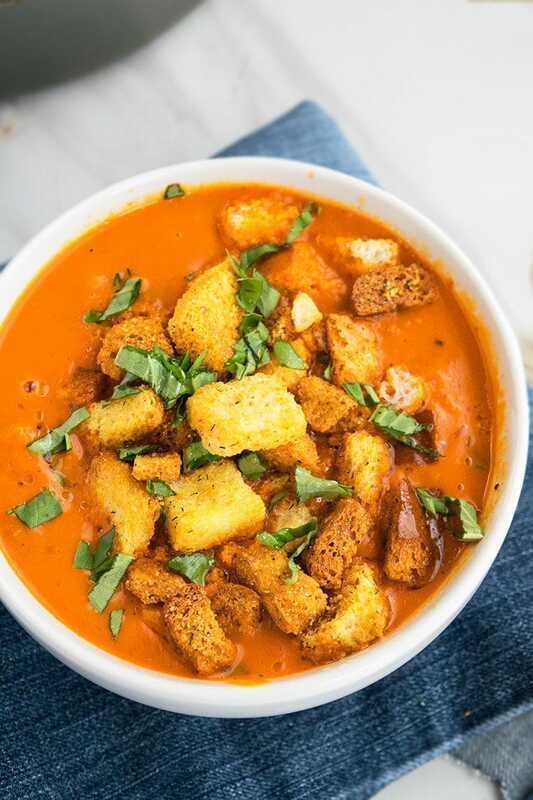 What sides to serve with creamy roasted red pepper soup? How to make make soup thick and creamy? -Herbs: Use fresh, roughly chopped basil, parsley, cilantro. -Croutons: Seasoned croutons taste the best. -Cheese: Shredded mozzarella and parmesan are best! Gouda cheese is also a classic choice. -Use nonstick pot to prevent sticking and burning. -Use low sodium broth and unsalted butter to prevent soup from becoming too salty. -If you don’t have vegetable broth, you can replace it with chicken broth. -Adjust the amount of seasonings, based on your preference. -Jarred roasted red peppers or homemade roasted red peppers can be used. -Sriracha sauce is optional but highly recommended since it adds a subtle spicy kick. You can also replace it with 1/2 test red chili flakes OR even omit it altogether if you don’t like spice. -All-purpose flour yields the best results. Don’t replace it with any other flour. -If soup looks too thin at the end, cook without lid on medium heat until liquid is reduced and soup thickens to your desired consistency. -If soup is too thick, thin it by adding some more broth or water at the end. Heat butter and oil in a nonstick pot over medium-high heat. Add the onion and garlic and saute until fragrant. Add flour and continue cooking until your have a thick paste that’s golden brown. Turn off heat. Add crushed tomatoes, roasted red peppers, broth. Use a hand held immersion blender to blend everything until smooth and there are no flour lumps. Turn on heat to medium heat. Add sriracha sauce (optional), Italian seasoning, salt and pepper. Mix and let it simmer for 5-7 minutes. Optional: Turn off heat and mix in milk. Garnish with freshly chopped basil and/or parsley. Top off with seasoned croutons, prior to serving. Enjoy!